In response to our article about the lack of 'Roads' in the City of London, we received an email from 81-year old Rodney Russell, with a fiendish puzzle. We reckon we can just about do it, if our Lord Mayor is prepared to walk certain sections. 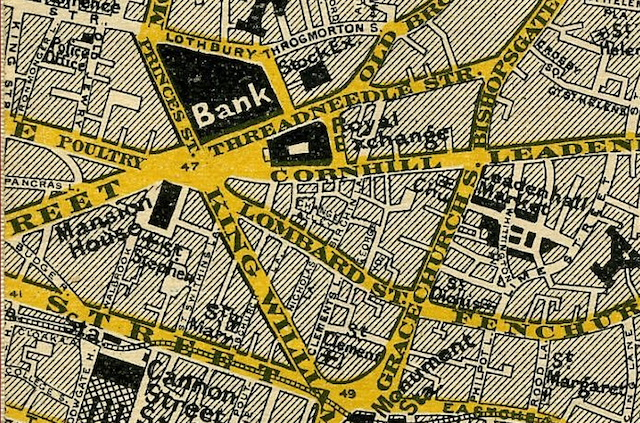 Those who want to take it one-step further might like to try the puzzle on a late Victorian map, when the road layout and street names were slightly different. Solutions in the comments, please...and do let us know if you have any further information about the song the puzzle comes from. Rodney is unable to find any reference.